Aiming to grab the attentions of deep-pocketed buyers, builders are developing condo buildings that are taller -- and skinnier -- than ever. In Midtown Manhattan, four of these super tall skycrapers are being built within blocks of one another. Completed this year, New York City's One57 reaches 1,005 feet, making it New York's tallest residential building. But it will soon be unseated. Within the next two years, both 432 Park Avenue and 111 West 57th St. are expected to soar past One57. Then comes the 2018 opening of 225 West 57th St., also known as the Nordstrom Tower. 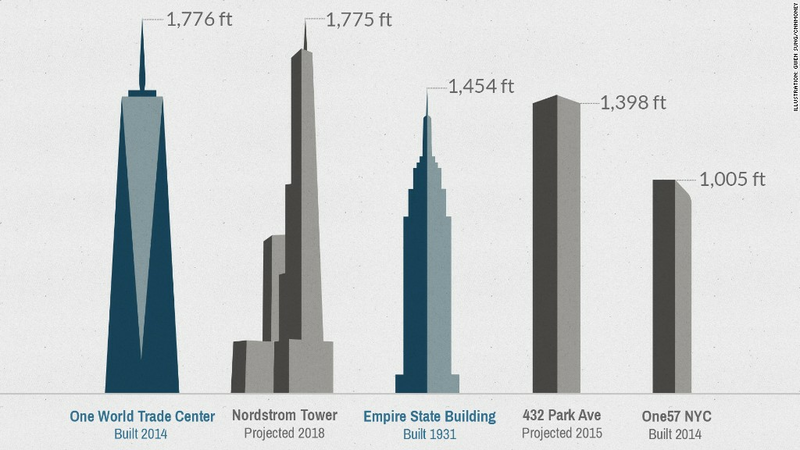 According to New York YIMBY, it's slated to reach 1,775 feet (including its spire), just one foot shy of the new One World Trade Center. "It's happening all over. I describe this as luxury real estate becoming the new global currency," said real estate appraiser Jonathan Miller of Miller Samuel. Any city where space is limited -- Hong Kong, London, Chicago, San Francisco and, of course, New York -- condo buildings are climbing ever higher, said Brian O'Looney, an architect with Torti Gallas and Partners in Maryland. And because available lots tend to be small, the buildings are also getting increasingly skinnier. The 111 West 57th building, for example, will only be 60 feet wide at its base. Demand for these sky-high residences is mostly coming from international buyers and corporate bigwigs -- Chinese businessmen, hedge fund managers, Russian oil billionaires -- looking for a place to invest and bragging rights. New York builders are developing condo towers as tall as the Empire State Building -- and one that will be just one foot shy of the new One World Trade Center. "The taller it is, the more prestigious it is. People want trophy homes," said Eric Trump, executive vice president for Donald's Trump's Trump Organization. Trump should know. In 2001, his father's company developed one of the first ultra high condo buildings, Trump World Tower, on Manhattan's East Side. The building topped out at 861 feet. These days, new materials and techniques enable developers to go even higher without residents getting seasick on windy nights, said Timothy Johnson, an architect with NBBJ in New York and Chairman of the Council on Tall Buildings and Urban Habitat. But before developers can even break ground, they are shelling out big bucks for these projects. Not only are city lots expensive, but they must navigate a minefield of regulations and community opposition. Once they get past those hurdles, they pay handsomely for skilled, experienced trade union labor. Per square foot, construction costs for high-rise buildings are more than twice that of shorter buildings, said O'Looney. "These developers have to build at the very top of the luxury market," said Miller. "That's the only way the math works." The floors on the upper levels produce much of the developers' profits. People are willing to pay big bucks for the views, according to Johnson. At the buildings near New York City's Central Park, for example, higher condos can cost 1% to 2% more per floor and there's a big jump, roughly 20%, for unobstructed park views, said Miller. Two penthouses at One57 have sold for a whopping $90 million each. 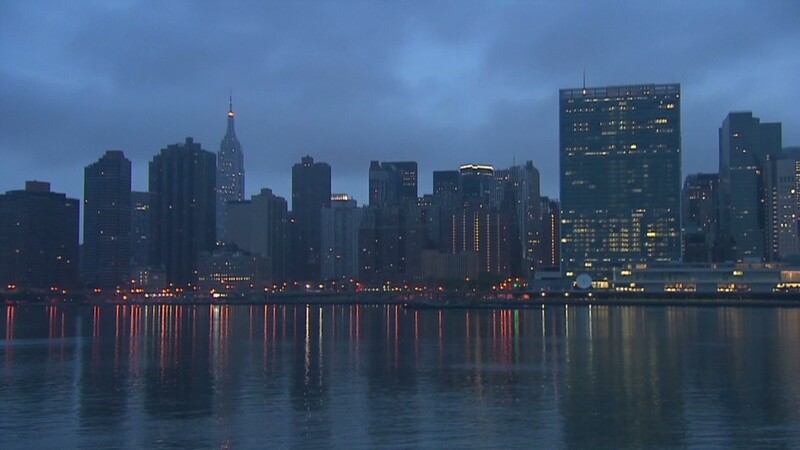 One at 432 Park is said to be priced at $95 million, one of the most expensive apartments ever sold. "We make tall buildings to be singular . . . to be noticed . . . to be seen as special," said John Torti, president of Torti Gallas and Partners. "This is true for those who build them, design them, and live in them."